Tata is the adoptive great-grandson of Tata group founder Jamsetji Tata. His father, Naval Tata, had been adopted from the family of a distant relative by Jamsetji’s childless younger son, also named Ratan Tata, and his wife Navajbai. Tata’s parents (Naval and his first wife Sooni) separated in the mid-1940s when Ratan was seven and his younger brother Jimmy was five years old. Both he and his brother were raised by their grandmother Lady Navajbai. Many years later, Naval Tata took a second wife, Simone, and fathered another son, Noel Tata. During the 21 years he led the Tata Group, revenues grew over 40 times, and profit, over 50 times. Where sales of the group as a whole, overwhelmingly came from commodities when he took over, the majority sales came from brands when he exited. He boldly got Tata Tea to acquire Tetley, Tata Motors to acquire Jaguar Land Rover and Tata Steel to acquire Corus. All this turned Tata from a largely India-centric group into a global business, with over 65% revenues coming from operations and sales in over 100 countries. He conceptualised the Tata Nano car. As he explained in a recent[when?] interview for the Harvard Business School’s Creating Emerging Markets project, the development of the Tata Nano was significant because it helped put cars at a price-point within reach of the average Indian consumer. Ratan Tata relinquished all executive power in the Tata group on 28 December 2012, on turning 75, appointing as his successor, Cyrus Mistry, the 44-year-old son of Pallonji Mistry of the Shapoorji Pallonji Group, the largest individual shareholder of the group and related by marriage. On 24 October 2016, Cyrus Mistry was removed as the Chairman of Tata Sons and Ratan Tata was made interim chairman. The decision went through intense media scrutiny that made many scrutinize the root causes of the sudden removal, and the resultant crisis. On 12 January 2017 Natarajan Chandrasekaran was named as the Chairman of Tata Sons, a role he will assume in February 2017. Recently, he invested his personal savings in Snapdeal – one of India’s leading e-commerce website and in Jan 2016 made an undisclosed funding in Teabox — an online store selling premium Indian Tea and CashKaro.com — an online discount coupons and cashback website. 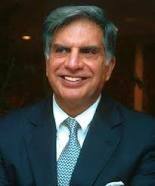 Ratan Tata has been making small investments in both early and late stage companies in India. He made investments of INR 0.95 Cr in Ola Cabs and INR 1 Cr in Paytm. In April 2015, it was reported that Tata had acquired a stake in Chinese smartphone startup Xiaomi, with specific terms undisclosed. In Jan 2016, it was reported that Ratan Tata invested in an online Pet care portal called Dogspot. 2004 Honorary Doctor of Technology Asian Institute of Technology.